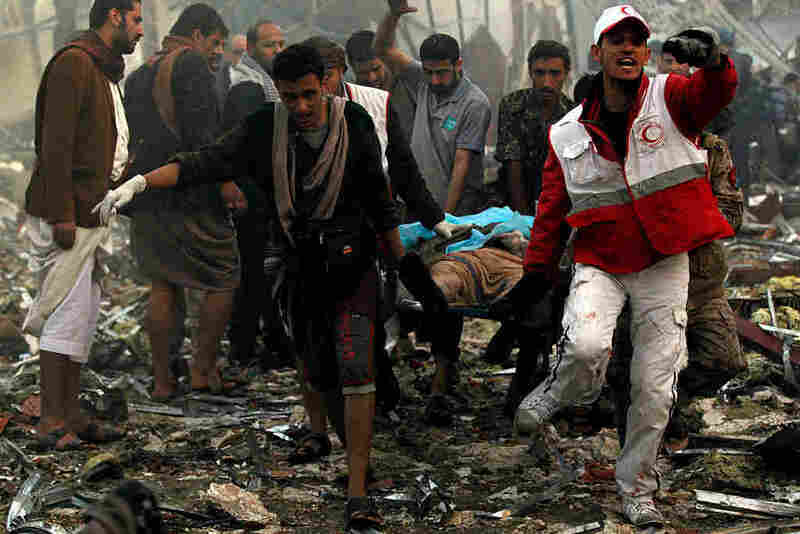 Saudis Say Wrong Information Caused Bombing That Killed 140 In Yemen : The Two-Way The Saudi-led coalition warplane bombed a crowded funeral hall in Yemen's capital Sanaa. An investigation has concluded that the coalition believed it was a gathering of rebel leaders. Yemeni rescue workers carry a victim on a stretcher amid the rubble of a destroyed funeral hall building following airstrikes by Saudi-led coalition planes on the capital Sanaa last Saturday. A Saudi-led coalition warplane bombed a crowded funeral hall in Yemen's capital Sanaa last week. The airstrikes killed at least 140 people and wounded at least 600, and a Saudi investigation now says they were a result of incorrect information. 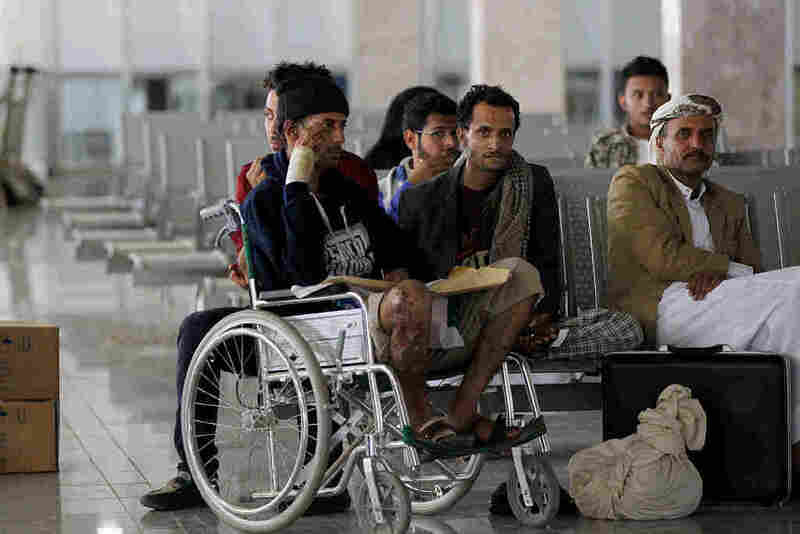 It was a particularly shocking incident in a conflict that has killed an estimated 4,000 civilians, where the Saudi-led, U.S.-supported coalition has hit marketplaces, hospitals and schools. The coalition supports Yemen's internationally-recognized president and is targeting Shiite Houthi rebels, who control the capital. In the immediate aftermath of the funeral bombing, Saudi Arabia denied any involvement. Then it said it would launch an investigation, as NPR's Jackie Northam reported. The results of that investigation were released today over Saudi's state news wire. The coalition's Joint Incidents Assessment Team said an unnamed party "affiliated to the Yemeni Presidency of the General Chief of Staff wrongly passed information that there was a gathering of armed Houthi leaders." That "party" then "insisted that the location be targeted immediately as a legitimate military target." The JIAT said the strikes were carried out without obtaining permission from the coalition command. It added that the coalition must take "action" against those who caused the strike, and called for "compensation to be offered to the families of the victims." It also called for Coalition forces to "immediately review their rules of engagement (ROEs) and update their procedures to ensure adherence in the future." "The White House quickly released a statement denouncing the attack and warned the long-standing security arrangement with the Saudis is not a blank check. State Department spokesman John Kirby says the U.S. is reconsidering its support.
" 'In light of the attack over the weekend, with the scrutiny that attack legitimately calls for, we are going to undertake additional reviews of aid and assistance that goes to Saudi Arabia,' he said." The attack drew widespread condemnation from the U.N. and human rights groups. Human Rights Watch said the bombing amounts to an "apparent war crime." It added: "While military personnel and civilian officials involved in the war effort were attending the ceremony, the clear presence of several hundred civilians strongly suggests that the attack was unlawfully disproportionate." Photos from the scene show the funeral hall reduced to a smoldering heap, as rescue workers desperately dig bodies out of the rubble. "The scene was catastrophic. Beyond what I can explain to you or describe... There were burned bodies and dead bodies all over the hall," as witness "Ahmed" told Human Rights Watch. Earlier this week, the U.S. carried out its first strikes against the Houthi rebels during the conflict in Yemen. It launched missiles against three radar installations in rebel-controlled territory, after missiles were fired from Yemen's coast at U.S. Navy destroyer USS Mason on two separate occasions.